This morning the cacophony of unmuzzled racism pours from every news outlet as the full desperation of Brexit meets the pent-up false-victimhood of Tory Englandshire. 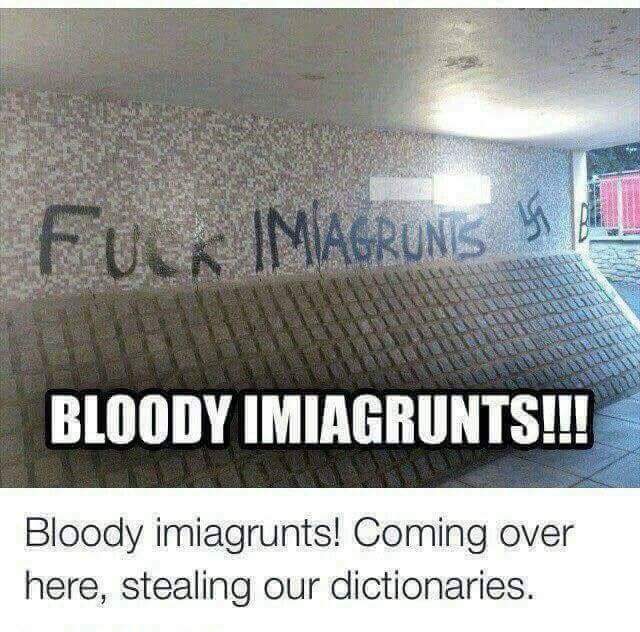 Imiagrunts are massing at our borders, apparently. Now they’re coming at us by sea. In language reminiscent of the Second World War the Dunkirk spirit is evoked and corrupted in one single sleight of hand. The BBC screams: “UK needs ‘more resources’ to tackle migrant boat threat” before reporting that a group of 20 people were rescued from an inflatable boat off the coast of Kent on Sunday. As Mittel Ingerlund tries to decide which is truly more important, mourning the loss of the Great White Hope from Top Gear or the Nadine Dorries coup the news cycle unfolds before us. Which makes us more mournful and able to wallow in a sea of self-pity and instant and constant nostalgia, the days of Jeremy Clarkson or the days when we stood alone from Europe, a full five bananas in our charge? That’s a ‘mainstream’ commentator arguing that there’s systemic distortion of the electoral system by immigrants. It’s the borders of language not nation that are being breached. We’re being ‘invaded’ not by people but by the language of fascism. A few months ago it was possible to have a reasoned debate about language, pointing out that people fleeing war were refugees, not immigrants on a jaunt. That language debate is over and the deliberate re-branding of people seeking sanctuary is complete. The state broadcaster repeats it and the tabloids scream it out in an ecstasy of fear and panic, even while the figures for British assistance of refugees is paltry and pathetic compared to other european countries. What is at stake is completely different vision of British society, one that revises history as well as projecting forward an idea of Britain ‘unleashed’ from pesky workers rights and cleansed of (implicitly terror-suspect foreigners). News Thump’s story that “Transylvania joining EU could see one million vampires in UK by 2020” is only a millimetre away from the hysteria of the language about Turkey, Albania and the rest of Eastern Europe evoked by Brexit and their outriders. As Sky News warns us “live” that “More migrants could be crossing the Channel by boat” and that “Britons say they are worried about security” the lovely Daily Express has a picture of people in danger of drowning with the caption “Cost-cutting Britain only has THREE boats to stop migrants reaching UK’s 7,700 mile coast”. Apparently “large swathes of the British coastline are unmanned”. Maybe we need to build a wall like The Donald? It’s this culture of racism that gives permission for ordinary people to be abused everyday, a phenomenon witnessed by Tasmina Ahmed-Sheikh and Humza Yousaf and is perpetuated by a tabloid press and given repeated air-space by the broadcaster. Without control of the media, defence and immigration Scotland is in danger of being distorted by this narrative. Despite overwhelming support for Remain in this country and with Nicola Sturgeon and Fiona Hyslop attempting to inject some reasoned argument into the debate, the onslaught continues. Talking last week at the Scottish Parliament debate on Europe Hyslop cited the EU’s support for worker’s rights including a 48 working week and 20 days of holiday as a minimum and the importance of EU migration to “fill the skills gap” in the Scottish economy. She also pointed to the value of collective EU investment in renewable energies technology (see more at Chatham House Carbon Briefing here), increasingly in contrast to Amber Rudd’s dismantling of the sector. But this is rational-talk whilst people are talking Bananas and Hitler. Tiny numbers of people travelling by sea in small boats with children are not a threat to you. To have to re-state this simple truth is a travesty and a sign of a complete failure of political leadership and the triumph of the politics of hate. Are you taking the piss out of the wilder voices in the Nat cybercaves? If so, well done. If not, get a grip mon. I guess it’s easy for people in Scotland to tut tut at some of the comments from a sizeable proportion of the English media , we are not experiencing the same level of immigration or anywhere near the speed as the English are , they might in fact vote to exit the EU on this issue on its own . This idea you can’t talk about immigration without being labeled a racist bigot is part of the problem ,for years Politicians have avoided this prickly little issue for fear of being branded with , the usual mantra designed to shut up and blame the messenger without addressing the issue . I believe if you scratch the surface we Scots are probably just as concerned about this as those south of the border , but possibly not as vocal , Yet . With all due respect I think you may have missed the underlying point. If you believe what you write, a more productive question to be asked, is why the widespread and legitimate public “concern” in England has been so comprehensively ignored by politicians for so long. I would respectively suggest that while the Conservative Party represents a neo-liberal ideology that says one thing about immigration (and is rewarded at the ballot box for it), it pursues policies that function to produce precisely the opposite effect to everything they claim. I doubt if this can be brushed aside as mere accidentalism. Of course you may believe that the disparity between policy and effect is the result of Conservative incompetence; but I leave you to choose where the problem rests. Whether deliberate hypocrisy or blundering ineptitude, this kind of devious, ‘spin-driven’ politics is going to end badly; and lo and behold, it is ending badly. Meanwhile Scotland urgently requires to sustain a growing population as a necessary condition for stable economic growth, which can only be achieved by new arrivals from outside Scotland, as the current Scottish birth rate is too low (accepting a falling population combined with an exponential rise in the elderly is a catastrophic policy – and this has been the complacent legacy of Unionism over many, many decades); and it is clear that this policy of encouraging new entrants into Scotland (in our universities, or in the wider community) promoted by Scottish governments in the last few years, is being handicapped by Westminster policies (a bizarrely paradoxical outcome for Westminster, if you care to think about it – it is as if Scotland is the only place in the UK they really do not want new entrants, save in the case of migrant crises where Scotland always does more than most in the UK). There are good illustrations of this Westminster failure in recent events covered in the media. The “immigration crisis” illustrates the abject failure of political leadership and imagination. Politicians, might I respectfully suggest, have not ignored the “widespread and legitimate public “concern” in England” – they have played it like a Strad, pandering to the lowest of human instincts: fear of the “other”, fear of “change” etc. From Enoch Powell’s “rivers of blood” to Cameron’s “swamped” and the mea culpa’s of Labour who confessed to not having taken immigration seriously enough politicians have not led the debate with arguments to allay fears and celebrate immigration as a social good, but have climbed down into the gutter along with Farage and the rest of trash of the popular press. Fear was the weapon of choice during the IndyRef and we see it being used once again with depressingly predictable results. A politician’s job is to lead the country to a better, more humane, nobler concept of itself, but when we’ve got a thoroughly nasty set at the top then society itself becomes rotten. I responded to Robert Graham’s apparent, or implied claim that there was widespread and legitimate concern in England. Whether he is right in his judgement or not is of course another matter, but I wished to draw attention principally to the Conservative Government’s treatment of the issue, which is in any event, duplicitous. The responsibility for this unsavoury political mess I rest at the door of the Conservative Party and Government; and nowhere else. Approaching this from a different perspective; holding political parties responsible for their reckless and ill-judged (or worse) actions is one thing, but while I may have some sympathy for your frustration, I am disinclined to adopt an approach that appears simply to settle for condemning large swathes of the English electorate. This seems to me an approach least likely to be politically productive or produce constructive results. I am a sceptic by nature, but I would prefer to think a little better of people. The whole matter does, however illustrate quite well why, in Scotland, we are on a trajectory leading us ever closer to independence. My main point is, that insofar as immigration is a “concern” in a negative sense, it signifies the failure of politicians to lead the debate in a positive way and to correct many of the misapprehensions on the subject, preferring instead to reinforce these. Amber Rudd? Sounds like a character out of the Simpsons. Is this name for real? the majority of people inhabiting the capital city of the UK were not born there. By and large, the traditional white working class families have been driven out. And the message has been pumped out for years by big business and the politicians that everyone should welcome this new multicultural society. However, that is not how ordinary punters think. And the cosy middle class liberals thinkers would be better advised to get real. And, as it is often advised, they should “get out more”. The huge increase in immigration across Western Europe has created significant social problems, though they vary greatly. It is a far greater problem in much of England than in most of Scotland. (This may be of little consolation if you live in Govanhill.) Many people worry – rightly, I think – that these problems will worsen and that the losers will continue to be the least well off. For the social democratic left, it has contributed to a disastrous slide in support. A few people Paul Collier, David Goodhart and Frank Field have pointed out how important this issue is and how necessary it is to face it. Many others, have chosen to pretend the problem is not there. Still others, like Mike Small, have resorted to the familiar dead-end tactic of denunciation. The recent election demonstrated how close to irrelevance the Scottish Left is. It would be ironic if the Scottish Left becomes part of ‘left behind’ Scotland. Hmm. Without wishing in any way to diminish the human tragedies unfolding in front of us, there are two realities we have to bear in mind. The first is that 49% of Scots want less immigration – the same figure as in the UK as a whole, while 15% think it should be stopped altogether and 38% feel that immigration is bad for Scotland (YouGov). The second is that the Scottish Government has only agreed to accept a “fair share” of immigrants to the UK. It could of course take more if it wished. The hand-wringing of this post is not a sufficient answer to a global tragedy. This is a weak article – it makes the mistake of conflating refugees with migrants, a mistake that when repeated at a political level has seen the erosion of refugee rights. It is possible that refugees might come in such numbers that they destabilise a neighbouring country (Jordan would be an example), but public concern is mostly with open borders – i.e. migration. The post-war benefits of a welfare state, of public healthcare, were built on realtively homogeneous, contained and predictable populations and economies. A more liberal society and economy is possible (America is an example) but it requires an equally liberal approach to welfare and health – that is you will have to supply most of it yourself. I have no facts or figures to back up this observation, but it seems to me that Scotland is seeing significant inward migration – of English, from England. It may just be the accident of where I live (Moray) but the impression locally is of large numbers of “refugees” from the overcrowded south, with its high house prices, oversubscribed schools, pressurised social services, and – let’s face it – for some at least, unwelcome multicultural change. Perhaps someone “out there” has access to figures to confirm or deny this demographic? After all, it has been adduced as one of the explanations for the stubbornly Unionist character of the country. There is facts and figures though , national census. Heavy read , but some emails can help directed to them. Parts of Scotland , ie the wealthy parts have an above average incidence of English incomers , yes I can use the term incomer without being nat-racist , or should I use the term economic internal migrant? There is correlation there on no voters and of course Tory being above the Scottish norm. Edinburgh , the islands , Aberdeen , Dumfrieshire , Berwick , and West Dumbartonshire can see over 13 percent and the unemployment rate does not correlate with locals percentage wise. 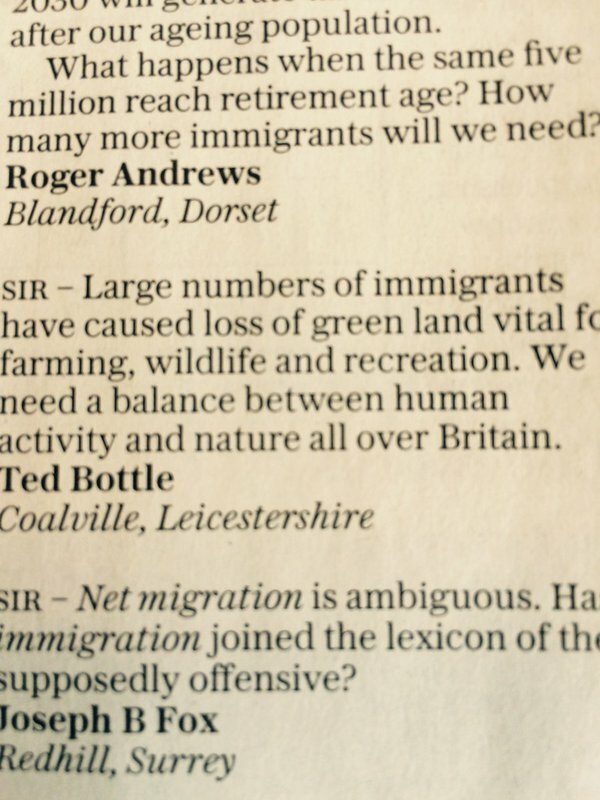 You will also see that these “migrants” are on the higher income bracket , or retirees having sold up their bricks and mortal wealth further south as you mention , so therefore are they economic migrants that are driving up house prices… something lovingly talked about in the usual English papers. I think there was already a post somewhere about how the arts and eduction are also a high employment area for English born Scottish residents. I think I will start a lottery on either SBBC or STV news going a day without an English accent , it would be a rollover to rival the biggest euromillions jackpot…. and never won. Its getting so bad that even a sitcom about a Scottish Street has nearly half the cast being English , wots next Robert Nesbitt a life in persepective starring Ricky Gervais? Migration has a long history. I believe it started in Africa about 2 million years ago and has continued ever since in greater or lesser waves as hominids moved into new territories, probably for a multitude of reasons, but including population pressure, scarcity of food and competition from other animals, as well as other hominids. It has always existed, it probably will always exist. We have to find humane ways of accommodating those on the move. your not wrong , but the new concesus is that the lesser human is the one that thrived with the super iceage driving all species back towards Africa , hence the caves in Spain and new one found in Portugal just last month. The this land is ours though is a misnomer , this land is the property of the elites pure and simple , where the masses are fooled thoughout history that it is theirs , but only in the time of war to protect the elites masses wealth as thier patritoic serf sandbags. Prior to modern media it was kings or church that did that decision making – but for those that would financially benefit the most , not the tenant serf , today that wealth is even larger than that of Kings or Chruch of history , and in more hands , aided by the elected fewer like them. Todays refugees , or imagrunts , can be the solution to many woes , or the agitator. Italy like Scotland and most of Europe is in birth decline , so refugees may be that solution , which is the reason why Germany embraced and took in the most. Though birth decline is not just an EU problem Japan is also suffering from it. Actually only the developed world is suffering from it , though I suspect China in 20 years will have a major problem. But that birth decline is a direct result of income , look at home ownership and the lack of council housing , the charts are very simlar , so subsidsed housing and ever increasing taxation has a direct bearing on it , ie less cash less kids , more affordable housing making mortgages 10 years or less – more kids? Those voters that keep politicans and their like wealthy are in normal elections predominately pensioners , Germany knows theirs would prefer pensions over imagrunts , but in the Uk it may be a case of cutting of the nose. But when you consider that the largest single generation ever are about to become pensioners at the same time , along with thier children , then costs also rise. HMG was not pension investing , but spending that tax , sometimes with bribery to get elected , kicking the can down the road , but we are nearing the dead end. Hence the shift to private work pensions to try to stem the bleeding somewhere , then will come the last hurrah of private pension dipping to get over the last hurdle or LTGDP spiking massively. NHS , the cost to keep pensioners healthy will be bigger than the generations under them with their diabetes epidemic , but again without imagrunts there would be no doctors… something that your voter cant seem to get their head around , ie no imagrunts to use up services also means no doctors to supply those services , and less taxes to pay pensions – due to lower birth rate of thier own progeny. The Uk has a history of immigration , wanted or not. Angles , French , Vikings , even Celts that brought with the Romans the Scots pine from Iberia , so even our bloody native tree is an immigrant , as are rabbits , and most of our veg , even our Saint thus our flag. There is benefits , pun intended , to having immigration. Australia though has a points system for immigration , no work related vacancy means no entry. As has been shown this week , this makes no difference in the numbers decreasing , the number gets even larger to fill jobs with lower birth rates combined with the increasing number of retirees , yet the tax bills , housing prices will still have go up in correlation. So what could be the answer then , some form of logans run or soylent green? How about offshoring pensioners to nice little cheap housing sheltered accomodation estates in Spain , or Greece they could do with a bung , just like so many brit retirees already do but by choice … for them to sit writing letters back to the Uk Daily Heil about Uk letting immigrants in from Syria and the EU , and somehow fail to see the irony. Yo, c rober, I’ll buy into that, nice little wrinkly place in the sun for a while, then the cool clinic with the pretty nurse and the doc with the syringe, Amy Winehouse or Lake Street Dive on the stereo, and maybe your latest posts to Bella on iPad to cackle over: you are SO on the button!